The micro drawer is a unique design combining the footprint of a flip lid with all the functions of a front opening slide out cash drawer. it is ideal for any situation where space is limited due to its short opening of 173 mm. 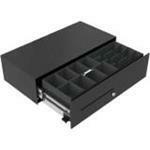 it also provides a high capacity insert which is compact and easy to carry to the back office and store in a safe. the micro insert is compatible with our 460mm wide flip lid drawer models (460mod) providing a very practical solution for a retailer using both flip lid and slide out drawers within their estate. the standard micro drawer size is w453mm x d224mm x h130mm, but can be varied as required.